Of a truth, infants spend most part of their early lives in cribs. You’ll be helping yourself and your baby if you choose the best crib mattress, as both of you will get good night rest. Issues about the right mattress are not to be joked about. There is need for us to test and be sure that the crib mattress is chemical free, and it must be manufactured from certified and non-toxic materials. Also, the mattress must have a spill-safe cover and price is an important factor because, its not everyone that is rich. I guess that is the truth, right? If you had taken a look at the crib mattresses sold in the market presently, you would have known that it is well and actually overwhelming, shopping for a crib mattress. There are so many crib mattresses available today, but how are you going to recognize the right mattress for you and your baby? Both innerspring and foam mattresses are safe, but there are key differences in shopping for both of them. What to look for: Look for a higher coil count (the coils are closer to each other) and this creates a firmer mattress surface. Better still, look for a lower gauge of steel, which means thicker steel. Cool feature: This kind of mattress has a standard cushioning layers which are made of PET (a polyester recycled from water bottles made from plastic), and it acts as hypoallergenic cushion. Upgrade with: You can upgrade the mattress with border rods (a steel frame attached to the mattress perimeter); weight distribution bars; corner protectors and steel clips. All these materials will make the mattress core last longer. What to look for: Look for a high-density polyurethane foam core which is capable of holding 1.5 pounds per cubic foot. As the number of pounds per cubic increases, the core becomes heavier, and it becomes softer as the number decreases. There are lower-cost alternatives to foam which are bonded polyester fiber cores, but they cannot be classed as a high-density foam. Cool feature: These mattresses have light weights. Their weights are between 8 to13 pounds. Upgrade with: Upgrade the mattress with high-density edges so as to protect the sitting sides of a baby. Weight: You have to be changing the crib bed regularly. Also, there are times you have to do this in the middle of the night even when you’re tired. So the mattress should be easy for you to pick up. A mattress of any weight between 10-20 pounds should be great for the baby and you. Waterproofing: Be very sure that the mattress youre getting is waterproof, even if you intend using a sheetsaver and a mattress pad due to unexpected case of diaper blow-outs. Being waterproof gives an additional protection to the mattress to prevent leakage and other accidents from seeping in. Chemicals: You need to get a mattress made with materials that are harmless to your baby’s skin because the baby will be spending much time on it. A certification to check for is GREENGUARD, and it measures the chemical emission from the mattress. If you see any certified mattress, it means that the mattress has been tested in the laboratory to know whether its air quality poses any risk to babies. Organic content: An organic mattress will cost you more, and you cannot get a mattress that is 100% organic because they still contain plastics and steel. However, parents have nothing to fear when they have organic cushioning or covers. Ostapa says when shopping for a crib mattress, it should be checked to see that it contains another firmer material that will keep it in shape (organic cotton cushioning and other fibers doesn’t bounce back). You need to look for an eco-friendly treatment to get extra protection, as organic cotton covers are not waterproof. The first question parents have about the crib mattress of their baby is, IS THE MATTRESS SAFE? Many manufacturers rate their mattress as safer than other brands. For the sake of getting sales, many misleading information were circulated in the market. But it is compulsory for all mattresses to pass federal regulations. No scientific proof has been found to justify that a certain mattress material will cause or eliminate the risk of Sudden Infant Death Syndrome (SIDS). To create a safe sleeping environment for your baby, you need to implement the presented crib mattress safety tips in this article. 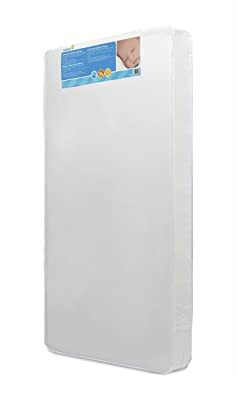 It is a top priority to get a waterproof crib mattress cover that can be cleaned with ease. Infants and toddlers can at any time mess up their mattresses with leaking diapers or accidents from potty training, spit up, and other soiling. Its always good to have sheets and mattress pads that have protected covers for extra protection. Vinyl is waterproof and we have some that are improved with antibacterial treatments to prevent bacterial growth on a mattress. If you’re selecting a fabric-covered mattress, make sure you choose the one that has waterproof surface. There are some fabric mattress covers that are unprotected or only have a bottom layer of vinyl sealed onto them. This therefore makes the top surface (the closest to the baby) unprotected, allowing stains and liquids to remain on the surface. Moonlight Little Dreamer Crib Mattress produced by Moonlight Slumber, is a top-rated crib mattress which also is an excellent buy. This brand of crib mattress on our list of safest baby mattresses is number two. It is more economical, bargain mattress, and a double-sided foam mattress. 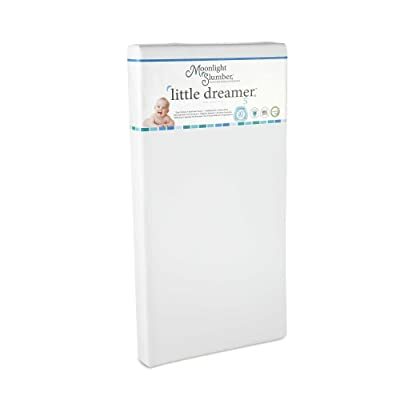 Moonlight Little Dreamer Crib Mattress has made massive efforts to stand out among other brands on this list with Certipur certifications to clear its use of chemical. This mattress is PPC and vinyl free, thus making it a non-smelly mattress and also a healthy one. Issues relating to flammability are subject to federal regulations just like other crib mattresses on this list. So for Moonlight Little Dreamer Crib Mattres, fire safety is ensured. Above all, the feature I like most about Moonlight Little Dreamer is the seam that goes round the middle instead of the corners, and it look amazing when youre clearing up a nasty nappy change. This feature and the fact that the mattress is a lightweight, double-surfaced foam mattress with selling price of $186 makes it an excellent buy. Even though it did not top the list, this crib/toddler mattress is a popular buy in year 2014, and it is still one of the highly rated crib mattress by many buyers. Therefore, its a sure bargain. Naturepedic Organic Cotton Crib Mattress is manufactured by Naturepedic, who are known to be makers of the best organic crib mattresses. The second on the list is this mattress and I totally love it. When it comes to delivering toddler crib mattresses which are 100% natural, organic, and non-toxic with safety seal for these, Naturepedic ranks first. This mattress brand is at the higher end of the market when considering value, and when compared to Simmons BeautyRest or the Moonlight Slumber Little Dreamer, it ranks second. This mattress is being sold at $259 because youre paying for a high quality, 100% natural, organic, and non-toxic mattress. 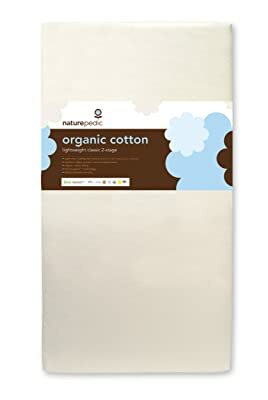 Naturepedic Organic Cotton Crib Mattress is manufactured in the USA from 100% organic cotton, and it has two-stage dual firmness, thus having a firm infant side and a less firm toddler side. This crib mattress brand has both water surface and waterproof seams which makes removing germs very easy. We chose Safety 1st Heavenly Dreams as the best crib mattress and this is a great deal. The mattress is firm, comfortable, and its vinyl covering helps it in resisting stains and smells. The mattress cover is waterproof and in case you need to wash or change the cover out, there is an attached zip to make this possible. The mattress fits any standard-sized crib and bed, and its measurement is 52.5 x 27.5 x 5.5 inches, so you can use this measurement to know if this mattress will fit your own crib or bed. This is a foam crib mattress. Even after using it for a long time, it will still maintain its shape (this also works well in a converted crib-to-toddler bed). One advantage of the absence of spring is that, kids wont be able to jump on it. Yes, kids do this! The mattress is also lightweight, easy to wash and its sheets are easy to change. In addition, the crib mattress is made from safe materials that are non-toxic but the mattress is not 100% organic. Above all, Safety 1st Heavenly Dream is definitely a great crib mattress, and I did recommend it to parents that have standard-sized cribs.